What is a “slow-moving” slide? Why can’t you just blast the hillside and be done with it? When we say “slow-moving” slide, we mean it could take months before it stops moving. Geologists currently monitoring the slide don’t expect it to release in one large mass. How do we know? The data we’ve collected shows it moving at a rate of 1.6 feet a week. Which brings us to blasting. From the outside, it makes some sense. Drop some charges, trigger the slide and then clean it up. But, it’s not quite that simple. If we start removing material or blasting it from the hillside, it will actually make the area more unstable, creating fissures in other areas and would likely release larger amounts of debris in an uncontrolled manner. For some perspective, we’ve spent the past several years blasting rock from the hillsides along I-90 as part of the project to stabilize rock slopes and add more lanes. When we blast, it’s in very small sections and then we excavate any loose material after the blast. Over the past five years we’ve removed a little more than one million cubic yards of material – or about 200,000 cubic yards every construction season (April through October). The Rattlesnake Ridge slide is made up of about four million cubic yards of material. Also, blasting an unstable hillside simply isn’t safe. In order to do a controlled blast, crews need to drill into the hillside about 20 to 40 feet to put live charges into the hole. With the hillside moving, being able to drill accurately while also not causing more instability would be incredibly challenging. Even if the holes were drilled accurately, there’s the possibility that the charges won’t go off, meaning the crews would then have to sort through millions of cubic yards of debris looking for live explosives that could go off. It’s just too dangerous of a situation to put workers in. So for now, we’ll keep doing what we’re doing. Workers continue to monitor the hillside, gather data and make preparations for when debris begins to come down. We’ve joined with the Department of Natural Resources to select Wyllie & Norrish, Rock Engineers Inc., of Seattle as our third-party geotechnical firm. They have a combined 80 years of experience in specializing in rock slopes, landslides, tunnels, blasting, foundations and rock falls. The firm has already started analyzing data and will provide a summary with their conclusions later this month. Last week our geologists began using 3-D Terrestrial LiDAR on the western slope of Rattlesnake Ridge to increase our monitoring of the landslide. Results from that monitoring are consistent with what we have been seeing with the movement of the landslide, and the new information helps us better understand the slide and its expected behavior. With all of the information available, including the new 3-D LiDAR, we not only expect to see small rocks coming from the western slope but also large amounts of debris to sluff off. This amount may or may not be of sufficient quantity to reach Thorp Road. A visual change in the western slope doesn’t mean a change in the behavior of the landslide. It conforms with the current expectation for this specific slope. We are still confident that the material coming down will not impact I-82 and the highway is still safe for drivers to use. A slow-moving landslide east of Yakima has put many on high alert, including drivers traveling along I-82 adjacent to the landslide. There are several agencies working together to investigate, research and plan for this situation, and each has specific roles in preparing for the slide. Our job is to protect the highway and make our best effort to help motorists avoid any obstacles on it. As the landslide moves, rocks could potentially fall onto the roadway. So far we have not seen any debris reach I-82. At the first sign of more movement or increased frequency of falling rock, we will close the highway. However, when dealing with Mother Nature, it’s hard to predict when this may occur. This is why we are working with local agencies as well as our crews to keep an eye on it. measure to keep rocks from hitting I-82 east of Yakima. Should you take alternate routes right now? We would close the highway if we felt it was unsafe. At this time those monitoring the situation have deemed the highway safe for travel and many of us are continuing to use it for our commutes. That said, everyone should make their own decision. What would be the detour route? If I-82 closes, several detours will be established. The local highway detour will be along US 97 from Granger to Union Gap and I-82 would be closed from milepost 58 to 37 until officials determine it is again safe for travel. Also, depending on the amount of debris that comes down, it’s possible that just the westbound section of I-82 would be temporarily routed along US 97. We’re preparing for all possibilities at this point. In order to weigh down the freight container, concrete barrier is placed inside of each container. Placing portable signs along I-82 to caution drivers of the potential for rockfall. So far, no rocks have fallen onto I-82, but we are monitoring the area closely. This week, our crews are installing a number of large conex/freight containers between Thorp Road and I-82 to provide rock-fall protection. Although each box weighs six tons, it won’t stop a landslide, but will protect against rocks. At the first sign of excessive movement or increased frequency of rockfall, I-82 will shut down as a precaution and traffic will be diverted to the detour routes. Where can you get information on the landslide activity? You can view updates on the Yakima Valley Office of Emergency Management webpage and Facebook account. You can also call their office at 509-574-1900 and choose option 1. While there are certainly a lot of unknowns with this landslide issue, multiple agencies with the appropriate expertise are working to monitor and prepare for all situations with public safety as our number one priority. I've seen the video on youtube and I think you should post a link to it so people can make their own decision about travelling that route. It's not a route I travel but I'd avoid it like the plague after seeing the video. It could be worse than the Oso slide. Rilly, we have seen the video. Unfortunately, the video makes it look worse than it really is to those who don’t have the expertise in the geology of the area. This slide is nowhere comparable to the OSO slide. These are two very different kind of landslides. We are working with landslide experts and the data and information we are receiving doesn’t indicate the slide will hit I-82, that it will stay contained to the quarry area and Thorp Road. The work we are doing is more of a precautionary measure to keep loose rock from falling onto I-82. We can assure you that if we feel I-82 is no longer safe to drivers, we will close the road. The one concern that seems to be un-addressed at this point is the possible effects on the Yakima River...I am sure you are looking at all possible senarios but it hasn’t been talked about. Marichele C, at this time we haven't installed a camera for public viewing. Jim Thomas, the Department of Ecology is looking at the river aspect. Since we deal with roads that's what we are worried about, but in the event the river is impacted and starts to impact local roads we obviously will get involved. ....I looked at the siesmic information ... terrestrial SAR or satellite SAR would offer a nice complimentary dataset for a complete "picture" of the area "in-action". I know you said on the 4th that you haven't installed a camera for the public. But will you be doing this or letting us watch hillside movement data? Susan Whitman: Thanks for the inquiry. We still don’t have plans to provide cameras for public viewing. You may want to touch base with the Department of Natural Resources or Yakima County to see if they plan to install cameras. Our focus is the safety of the traveling public and the roadway. Why are we waiting for it to slide? Why not start haul the dirt and rock off now so less comes down? mike lyman sr, this is a slow moving slide, which means it’s not going to start coming down in a huge mass like what we for the Oso or Nile Valley landslides. Material will start coming off of the slide in smaller amounts over a matter of days. When this starts to happen, WSDOT will have enough time to close the road for the safety of drivers. Those living near the slide area have already been evacuated. If we start removing material or blasting material it will actually make the area more unstable and likely to release large amounts of debris in an uncontrolled manner creating even more catastrophic issues. Local agencies, state agencies and emergency personnel all have plans in place to respond when the slide starts releasing material. We are also planning for worse case scenarios. The flavor that I get from the media (papers, tv, and your blog) is that everyone is standing by waiting for the hill to come down. Are you looking at options for stabilizing the slope that will prevent extreme slope movement? It's likely that a geologic structure was day-lighted by the quarry operation. Construction of a toe buttress inside of the quarry will very likely go a long way toward stopping the movement, but at a loss of quarry operations in that part of the pit. I don't understand why everyone seems to be accepting that the hillside must collapse. The slope will win the waiting game in that case, and that could be weeks, months, or years. I manage a mobile home park in Yakima, right on the Union Gap / Yakima boundary and many of our residents are worried that if that slide comes down and blocks the river, will this area of the city flood? If this situation occurs, will someone be contacting business' in the area or is there a specific site in case this scenario occurs? Daniel L: Thanks for the suggestions. At this time we aren’t looking at ways to stabilize the slope. Ronda Aldridge: The likelihood of the landslide hitting I-82 and the river is less than 1 percent. The reason you may have been hearing about it is because all agencies involved are also working on worst case scenarios. This would be one of them. I can assure you this is something that will most likely not happen. However, you can contact the Yakima Valley Office of Emergency Management to talk with them: 509-574-1900. With all the media coverage that this land slide is getting, I've been personally frustrated that there hasn't been much information posted on optional routes around the slide, for those wishing to use alternate routes and plan ahead of time, or have anxiety over death by landslide and are being forced to travel though a dangerous area. I have been trying to plan an alternate route in an area I'm unfamiliar with yet must travel and I prefer not to tempt fate. If the hill slides and I have to back track and find an alternate route, I will miss my appointment and this must not happen. Google earth doesn't even mark this rattlesnake ridge. Holly Holton MT ACOM - We understand your concern regarding the Rattlesnake Ridge landslide. Unfortunately, the media coverage has been less than ideal and creating more hysteria amongst drivers. I can assure you that I-82 is safe and if we had any concerns we would close it. However, with that being said you have every right to choose your route. 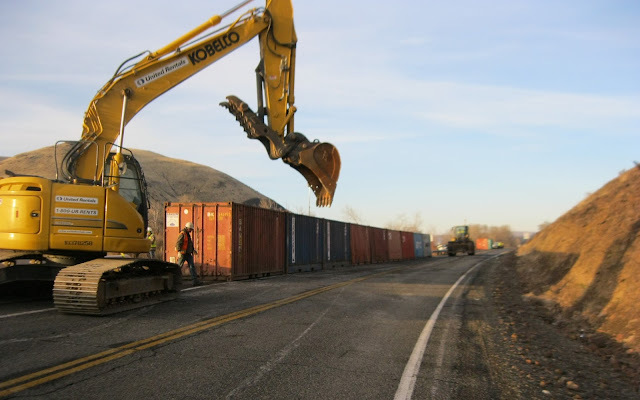 We haven’t made the detour routes public since we haven’t needed to close I-82. If I-82 closes, it would close from Union Gap (Exit 37) to Granger (Exit 58). Drivers would be able to access US 97 going east at Exit 37. Drivers heading eastbound would be able to access US 97 by taking Exit 58 follow SR 223 to SR 22, which turns into US 97 at Toppenish. Which WSDOT Twitter account should I follow?